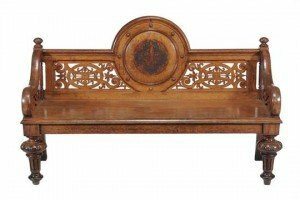 A Victorian oak hall bench, circa 1860, the raised back with central porthole containing stylised initials flanked by pierced scroll fretwork and conforming down swept arms, the plank seat above bulbous turned and fluted legs. 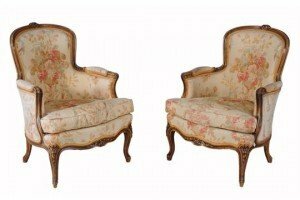 A pair of carved beech and upholstered tub armchairs in Louis XV style, last quarter 19th century, each arched tapering back above shaped padded arms, each cushion seat above moulded cabriole legs, headed by floral terminals. A 9ct gold tanzanite and diamond cluster ring. 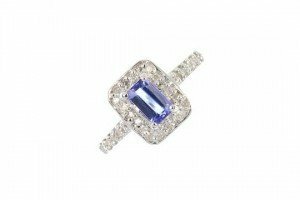 The rectangular-shape tanzanite, within a single-cut diamond surround, to the single-cut diamond shoulders and plain band. Estimated total diamond weight 0.10ct. Hallmarks for Birmingham. Weight 1.8 grams. 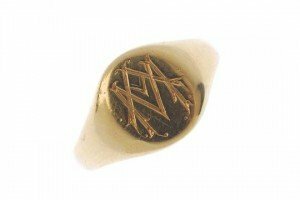 An early 20th century 18 carat gold signet ring, the oval panel with engraved initial monogram to the tapered shoulders. Hallmarks for Birmingham, 1919. Weight 4.7 grams. 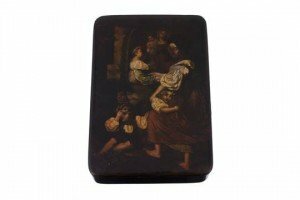 A German papier mache rectangular snuff box, 1830s, the cover painted with a family before a painting of the Madonna and Child. 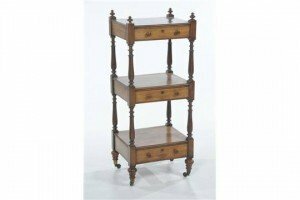 A George IV mahogany shelving unit, the square moulded top with turned finials above three drawers each joined by baluster foliate supports raised upon vase shape legs, brass castors. A 9ct gold topaz line bracelet. 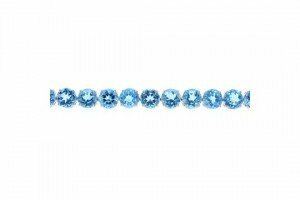 Designed as a series of circular-shape blue topaz, to the partially concealed clasp. Hallmarks for Birmingham. 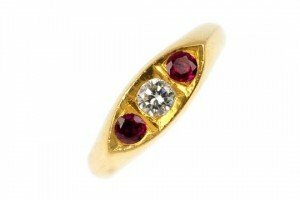 A diamond and synthetic ruby three-stone ring, the brilliant-cut diamond and circular-shape synthetic ruby sides, to the tapered band. Estimated diamond weight 0.25ct. Weight 9.8 grams. 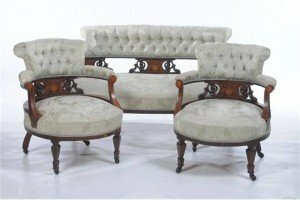 A Victorian three piece Rosewood and mahogany and inlaid drawing room suite, the settee with a curvilinear padded and button back above shaped Rosewood splats inlaid in satinwood with ribbon tied classical urns, padded seat raised upon shaped vase shape legs and castors and two conforming easy chairs. 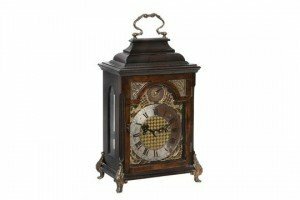 An 18th century ebonized table clock, the English four pillar eight-day twin chain fusee bell striking movement with anchor escapement, the brass break-arch dial with a strike subsidiary dial above a silvered Roman numeral chapter ring with arcaded minute ring, enclosing a chequerboard hath engraved centre and with rococo scroll cast and pierced spandrels, in a Austrian stained fruitwood case with foliate a swing handle above a stepped dome top, moulded corners and on foliate scroll cabriole feet. 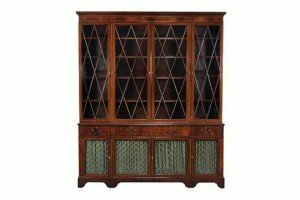 A mahogany and inlaid library bookcase, in George III style, late 19th/ early 20th century, the moulded cornice above four astragal glazed doors opening to adjustable shelves, the lower section with drawers above four brass grille panelled cupboard doors, on bracket feet. 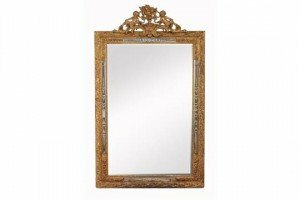 A Continental giltwood wall mirror, 19th century, possibly Venetian, surmounted by cherubs and floral vase above rectangular mirror plate within floral and scroll model frame. 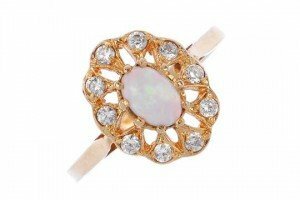 A synthetic opal and paste cluster ring of openwork design, the oval synthetic opal cabochon, within a circular-shape colourless paste surround. Foreign marks. Weight 2.1 grams. 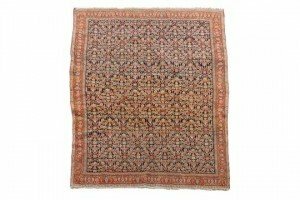 A Senneh rug, the dark blue field woven with an intricate lattice of stylised flowers writhing a red field border of stylised flowers. 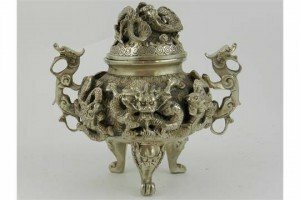 A Chinese white metal incense burner, moulded with dragons chasing pearls, on three mythical beast and scrolling paw feet, bears four character marks to base. 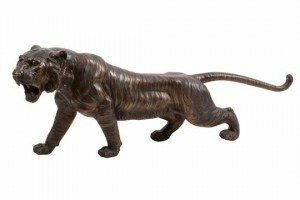 A patinated bronze model of tiger in the late 19th century Meiji style, 20th century, the beast portrayed snarling, its head turned to sinister, its stripes cast in low relief. 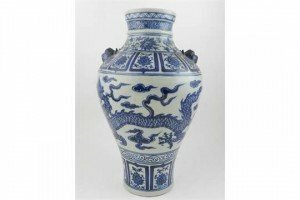 A Chinese blue and white porcelain baluster vase, the centre with continuous decoration of dragons chasing pearls, within panels of lotus flowers and scrolling foliage. 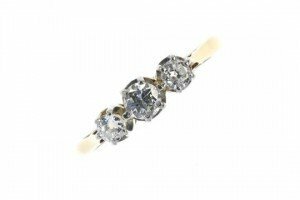 A diamond three-stone ring, the slightly graduated brilliant-cut diamonds to the tapered band. Estimated total diamond weight 0.40ct. Weight 2.5 grams. 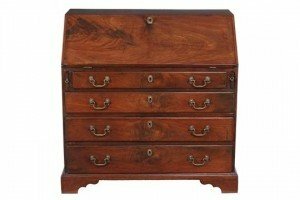 A George III mahogany bureau, circa 1780, the rectangular fall opening to an arrangement of small drawers, pigeon holes and a central cupboard, above four long graduated drawers, on bracket feet. 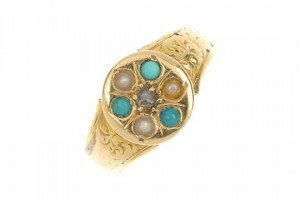 An early 20th century gold diamond, split pearl and turquoise ring. The diamond point, within an alternating turquoise and split pearl surround, to the foliate engraved shoulders and band.